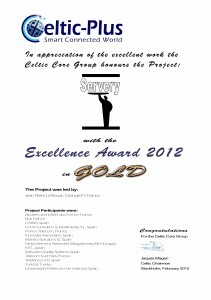 The SERVERY project was awarded the prestigious Celtic plus excellence award2012 in gold at Stockholm. SERVERY’s main objective is related to the creation of a Service Marketplace, i.e. the possibility for end user to access to a great deal of innovative services created by professionals or by the user‘s community. The idea is to take advantage of the Internet and the Telco environment, considering the different architectural approaches (the innovative one of the Web 2.0. and the reliable and standardized one of IMS). The marketplace infrastructure aims at bridging the Web-based and IMS network, in order to make available a totally new operating environment, based on the flexibility and friendliness of former and the reliability of the latter, specifically considering security, charging and identity management.